" Design. Build. Play! " 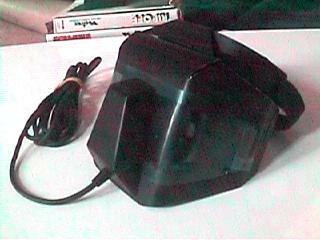 Add a 5" CRT to your Vectrex! !!! VECTORCADE PRODUCTION HAS BEEN PUT ON TEMPORARY HOLD !!! It's robust construction and beautiful finish make it a classic gamer's dream come true. Collectors can also appreciate its value considering only 50 unique units (serialized, & signed) will be made. Production of the Vectorcade will shut down on 9/1/2002 regardless of the number created. by Steve Bender If you haven't seen it before, check it out. (MVLP) [UPDATE] Theodore Mason has suggested an alternative preparation for the endcap so you will not need to secure the cable with hotglue in a later step. By cutting a square hole in the endcap and a slit down one side, the endcap can be flexed open to accept the square cable strain relief. Once the endcap is snapped into the end of the marker casing, the cable will be locked in place without the need for hotglue. [UPDATED] Theodore Mason has built a working set of 3D goggles using the original 3D imager circuitry which was traced out by Zack Ethridge back in 1995. The goggles are comprised of a homemade visor, color wheel, and etched pcb. Go to T. Mason's 3D Goggle Archive page to learn more. by Brett Walach Included in a ZIP file are 2 paper schematic designs for an Atari Driving Controller to Vectrex Adapter, along with all of the necessary data sheets for components used. This is a WIP due to the fact that neither circuit has actually been tested on a real Vectrex...please let me know if they work! Western Technologies True Type Font with logos, and Jay Smith character. (MVLP) Dimension on mvlp_protoboard_big.gif wrong, all pictures ok - Length of protoboard should have been 3.000" instead of 2.800". Added some helpful speak...if you find it you will benefit, just don't go looking for it...you may be dissapointed. by Rob Mitchell Repairing an original Vectrex Controller seems like a scary task, but fear not, Rob Mitchell is here to guide you through it. Updated MMC Page After some thinking about what is really needed, I've cut out some of the EXTRAs for the time being. Need a New Vectrex Theme Song! I took down the Vectrex theme song "Meteor" after request. I will try to locate a new song to continue the theme tradition. Updated Portals Added some some destinations, changed the layout, and added brief descriptions. More VecTech There is now a section in VecTech for MULTICARTS. Check in occasionally to see what's going on with the MMC I'm developing. New VecTech Articles Well, new enough. Maybe you've seen 'em, maybe you haven't. But dang it they're up now and you better read 'em! Added items will be noted NEW by "(Month/Day)".